A bachelorette's one-bedroom abode blooms with light colors, mod furnishings, and decorative solutions that cover flaws. Living solo for the very first time can leave a new homeowner with staggering problems. Luckily, interior designers can help decorate a newfound territory to suit the unique lifestyle and needs of the resident. 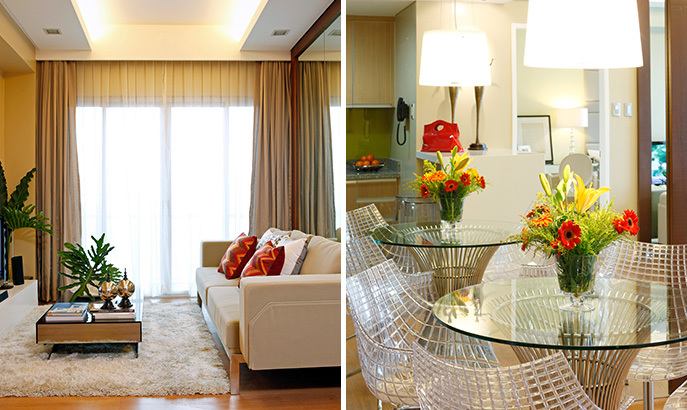 Interior designer Kristine Neri-Magturo was given free reign to spruce up a client's first major investment. In roughly two months, the small unit was transformed into a home that reflects the homeowner's style and personality. Original article by Kathleen Valle. Styling by Kristine Neri-Magturo. Photography by Miguel Nacianceno. Read the original article ("Pretty in the City") in the March 2012 issue of Real Living Magazine. To download a digital copy of Real Living Magazine, visit Summit Newsstand at https://summitnewsstand.com.ph/real-living.